The Puerto Vallarta & Highland Park Sister Cities Committee gather in Highland Park during its tenth anniversary. Since 2002, when the sisterhood between both cities was inaugurated, the social and cultural interchange undertaken through the arts, the traditions, the governments, the technology, sports, education, altruism and gastronomy, among other activities, have brought about an unprecedented level of citizens’ participation for both Puerto Vallarta and Highland Park. A deep-rooted Sisterhood has been established based on clarity, honesty, respect and trust. Participation agreements have been established unchaining a constant downpour of significant benefits for the communities and their histories. In Puerto Vallarta as well as in Highland Park there are already indelible traces from this solid sisterhood which has , through these ten years, contributed to the growth and maturity of two communities under distinct influences, but who have learned to communicate despite their differences, finding spots or areas where magnificent opportunities sprout edificating relationships among citizens, public servants and officers, always supported and overseen by the corresponding authorities. In México, Sister Cities Committees respond to an institutional mechanism established by the Foreign Affairs Ministry with the purpose of establishing and giving continuity to relations between a Mexican community with a foreign one, notwithstanding the temporality of its constitutional administration, either in its municipal or state envirionment. In Puerto Vallarta the relationship between both committees has lasted through several state and municipal administrations, zealously and exemplary complying with this, its main objective. 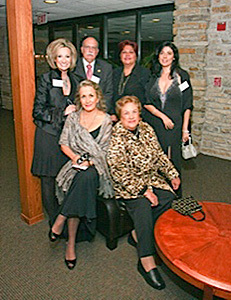 This was the first occasion when two top-level artists of our community: Ada Colorina (ambassador of the spirit of Puerto Vallarta), and Javier Niño (tireless representative and world-promoter of Puerto Vallarta), exhibit their works at the National Museum of Mexican Art, in the city of Chicago, Illinois. This distinctive exhibit on the identity and artistic maturity of Puerto Vallarta turns it into a source of constant and unrepeatable artistic expressions. The presentation of the Youth Orchestra of Puerto Vallarta was during the inauguration of the exhibit at the National Museum of Mexican Art Gala Dinner, and also during the celebration of the Tenth Anniversary of the Sisterhood between Puerto Vallarta and Highland Park, Illinois, at the Highland Park Country Club. There was a great deal of history between Puerto Vallarta and Highland Park, but even more so from this very special date where, once again, through the participation of all its members coordinated by Ms. Ana María Flores, its present President; the Sister Cities Committee will continue to stand out as an organization that, through specific actions, shares with other communities an interchange that will continue beyond generations.